Funny Names in the News is here! Apologies for the delay, Funny Name enthusiasts, your appointed correspondent was working late last night and completely forgot his more important blogging duties upon getting home, and instead ate an orange and fell asleep. D’oh! Well, the orange was good at least. But, on the bright side, here we are! We start with news from our Senior Hawaiian Shirt Wearing Correspondent Mark Sackler, who tells us of a woman in Hawaii with an improbably long name. Here it is. Take a deep breath. Ok, Janice Keihanaikukauakahihuliheekahaunaele has unsurprisingly been having some issues with her name not fitting on a government issued ID. I’m sure that’s not her only issue with the name. I can tell you from experience as someone with a slightly puzzlingly spelled last name, making any kind of phone call where you have to give your name can result in long alphabet recounting spelling sessions . I sympathize with Mrs. Keihanaikukauakahihuliheekahaunaele, also known as Copy-Paste-Janice, because heck, I’m not going to spell that out one letter at a time. It’s really fun to say though, good way to spend eight minutes of your day. As a bonus fact, the name in Hawaiian means “one who would stand up and get people to focus in one direction when there was chaos and confusion, and help them emerge from disorder.” That’s actually kind of wonderful. 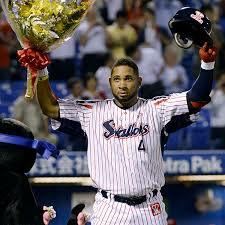 Even more impressively, Balentien broke the record using flowers instead of a bat. awkward segues.) EX-MLB outfielder/DH Wladamier Balentien broke the league’s single season home run record, originally set by the iconic Sadaharuh Oh in 1964. Mark adds, If Balentien’s name looks funny to us, you can just imagine what it looks like to the Japanese. Ha! You know what I’ve never heard? Japanese baseball announcers. I hope they’re as animated as those guys who do play-by-play in those frenetic “guy trying to leave giant maze while two other dudes in bear suits try to catch them” shows. Oh Japan, what a place. Coming back to North America, Toronto FC has a player on their squad by the name of Bright Dike. I found this “news” delightful so here am I sharing it. ading the article since Miley can do whatever she wants as far as I’m concerned and it wouldn’t particularly cause consternation in my world, but hey, you gotta love a Gundersen. Speaking of cuddly furballs, the San Diego Zoo has a new baby sloth! Yay! Cuteness overload. The baby needs a name of course, and why not make it funny. The zoo has ignored my numerous pleas to name the sloth Cornelius Drebbel, so instead they are having a vote to choose between Xena, Dulce, Guiana, or Subida. Whichever name wins, we all win. Thanks for reading y’all, and check back next week for more funny name madness! This entry was posted in Uncategorized and tagged baby sloth, baseball, funny, humor, long name, news, poor segues, soccer. Bookmark the permalink. I love the cuteness overload. What a send off for the weekend. Glad you got some sleep! Yeah, nothing like a baby sloth to send you off to the weekend on a good note. Thanks Fannie! Cornelius Drebbel the Sloth sounds like the greatest name ever. I can’t believe they’ve been ignoring your pleas! I know, I bet it’s because I haven’t renewed my membership yet. 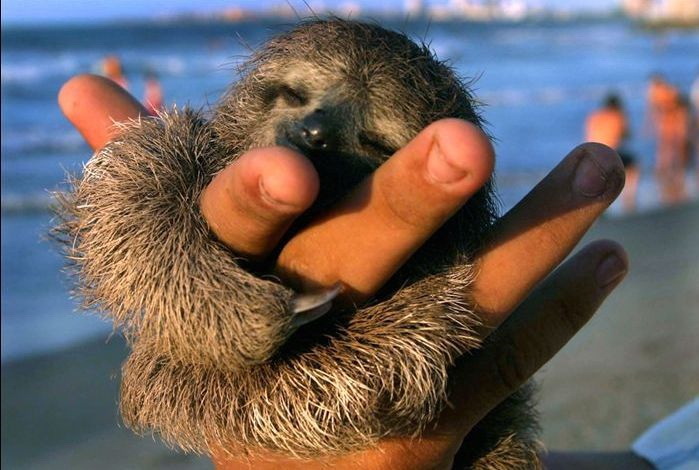 Now I want to hold a baby sloth! My wife has done that (hold a baby sloth). I’ll send you a picture if that would help. Me too! In fact, everyone should get to hold a baby sloth! I demand they add this to the Bill of Rights. Here’s some Japanese baseball announcing for you, for a compilation of baseball mishaps and superplays. Cornelius is the perfect name for a sloth! Few questions for you, Arto. 1) It’s late at night, you’ve had a long day, you come home to crash, and your late-night snack is an orange? No choc chip cookies or ice cream or half of a chocolate bar? Wow, girls and guys really are different. And 2) What problem do you have with the name Gundersen? How is that even remotely funny? 😉 Love Ms. K’s last name. That’s fantastic. She should for sure win some kind of award here. Oh oh oh–circling back to a previous comment thread (http://wp.me/p21IMO-Y6), I saw Garrison Keillor Sat night!!!!!! (You wanted to go to his bookstore.) He’s started an “after hours” radio show and the mom of one of my daughter’s friend’s was singing. Here’s a link for the show–it was very cool (11 kinds of awesome in ambspeak) and while not entirely appropriate for my 11-year-old-daughter it was still a good time. Just trying to keep my cool quotient up with you California folks! That is way to cool seeing Garrison Keillor! Yeah Liz. He’s only out here every couple of years. I will have to add that to my wish list for our next forray into the mid-west! You’re coming, too, right amb? Like you even have to ask?!? I wouldn’t miss it! Hah, yeah, I was tired, saw the orange and ate it because it was easiest. The chocolates and such are hidden out of sight so didn’t even cross my mind. I usually reach for one of the fancy beer bottles rather than ice cream so perhaps there are differences indeed! Oh, and I see very little funny with Mrs. Gundersen’s name. Maybe Edna. Edna Gundersen, let’s face it, it’s a funny combo. I believe this was one of Dave’s links so I think he may be the one with some explainin’ to do here. Ooh, I really do want to see Mr. Keillor’s programme live in the flesh some time. Love me that rhubarb song (and rhubarb in general). Awesome that you got to see him! Hahaha, great comment! Try and fit that on a driver’s license.